Tuxedomoon is an experimental, post-punk, new wave band from San Francisco, California, United States. The band formed in the late 1970s at the beginning of the punk rock movement. 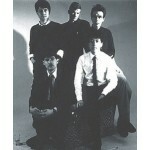 Pulling influence from punk and electronic music, the group, originally consisting of Steve Brown and Blaine L. Reininger, used electronic violins, guitars, screaming vocals and synthesizers to develop a unique "cabaret no-wave" sound. Bassist Peter Principle joined the band and in 1979 they released the single "No Tears", which remains a post-punk cult classic. That year they signed to Ralph Records and released their first album, Half-Mute. Eventually Tuxedomoon relocated to Europe. The band separated in the early 1990s, only to reunite later that decade. They have remained together since, releasing their latest album, Pink Narcissus, in 2014.